Sierra Hardware is such a gem! You can find almost anything there. So well stocked with practical household necessities. They are willing to order in special items that they do not currently have in inventory and kids can always find a toy or puzzle for playing. The staff is friendly and fabulous! Family owned since 1947, a hardware store like they used to be! Sierra Hardware is a California Department of Fish and Wildlife Agent - pick up your permits, tackle, hunting gear and camping accessories all in one place! Along with any household plumbing and electrical or hardware needs and even souvenirs! 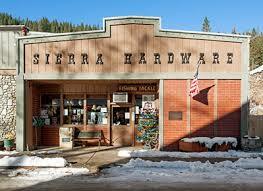 Sierra Hardware is located at 305 Main Street in Downieville. Open Mon-Sat: 9:00am-6:00pm and Sun: 9:00am-3:00pm during the summer.